i said before that the ultimate Vancouver experience is watching musicians perform in a converted yoga studio loft in the Downtown Eastside near East Hastings. but the penultimate Vancouver experience is probably watching musicians like Rose Melberg performing at a sushi restaurant in the DTES near East Hastings. there's something so definitive about combining beautiful soul-washing lilting vocals with california rolls and the concern at the back of your head that you might get mugged by a cokehead on your walk home through one of the country's worst poverty/drug/crime/prostitution-stricken areas. i discovered rose melberg at the secret loft show during the Music Waste Festival. if ears can do a double take, that's what mine did when i heard her sing and play the guitar, with Mint Records' Kellarissa backing up on vocals. There are a few bands out there that I've listened to and felt musical love at first "sight" - Sandro Perri, Cowboy Junkies, Sonic Youth, Radiohead, Great Lake Swimmers, Godspeed You Black Emporer, Red House Painters - and it is a feeling that's hard to explain. the music just feels so right, as though the artist happened to know exactly what your personal aesthetic tastes are and catered to it. you could resist it but you're still drawn to it. you don't have to try to understand the music, like i do with some of the weirder Vancouver music out there...your appreciation just floats naturally. anyway, that makes me sound awful creepy, but rose was playing again at the Safe Amplication Site Society fundraiser, this non-profit group that's dedicated to creating friendly, affordable, all-age, drug and alcohol free musical spaces in Vancouver. since i'm all about teetolling and going to bed before midnight, i'm all for it, so i went to the fundraiser. this was held at Hoko's Sushi Bar on Powell. the sushi chef is a big silent Asian man who is also the sound guy. he plays Nickleback between sets. the sound equipment is a karaoke machine. an eight year old boy buses the tables in joyful disregard of child labour laws. the food is delicious. other bands played too, including the Sunshines and also Kidnap Kids, who were absolutely adorable, if somewhat unrehearsed. like Ghost Bees chewing bubblegum, amazingly catchy melodies, brilliant lyrics, and boundless raw energy. plus a line like "let's all get with the greater good, let's all have a makeout party" is a slogan you can tattoo on your arm. also worth mentioning is the Miami Device/Show Gears/Star Captains show at the Media Club on Saturday night. This was part of the Vancouver International Jazz Festival which, by the way, is huge here, with hundreds of performers and over forty venues. rob and i were looking for any live show to go to, and so when we checked out Miami Device's MySpace, we knew we had to go to the Media Club. Rob's been really into the Dap Tones record label lately, and i've been in love with the Afrobeats, electro-jazzy sound ever since my band opened for NOMO at the El Mocambo, so this show was perfect for us. Star Captains had a great Herbie Hancock style of jazz sound to it, very tight and skilled, especially the keyboard player. genius licks and thoroughly enjoyable, finishing their set with the best jazzy cover of Michael Jackson's Billy Jean i've ever heard, leaving the stage with the audience singing. Show Gears was next; i feel like i can't fairly comment on their act because i am allergic to reggae music, but even depite that i found myself really liking some of their songs (the ones that were the least reggae sounding). rob and i were totally lucky to accidentally stumble upon this show. all three acts were Vancouver locals, which just goes to show that people who say Vancouver's music scene is dead are people who don't look (or listen) very hard. lately rob and i have been doing a lot of asian food. monday night, after building up a healthy appetite walking the entire Seawall, we poked our heads into the Barefoot Kitchen, this wonderful restaurant that brings totally new meaning to the word "asian fusion". first of all, it's run by actual asians, real live japanese people, so it's not just a bunch of trendy hipsters serving what their view of the exotic Orient is with bamboo chopsticks on square plates and too much soya sauce. also, it's beyond asian fusion: it's that awesome yoshoku style, which means that it's all kinds of food with a Japanese perspective. sort of like what my mother might come up with at home, because my sister likes Western food and my dad likes Korean food, so like meatloaf with bean sprouts and kimchi and an anchovy stew, or something. 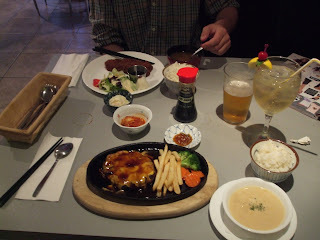 for example: i had the hamburg steak topped with cheese and teriyaki sauce, with sides of cream corn soup, kimchi, and rice. oh yes, and french fries. rob had the donkatsu (breaded pork chop) with a garlic sauce, miso soup, potato salad, and rice. we also ordered the most delicious sushi rolls we've had in a long time. taken with a Japanese beer that wasn't Asahi or Sapporo, and for me, a cocktail that consisted of Korean liquor + lemon + soda. absolutely delicious. most importantly, pretty damn cheap too, because it's all considered to be fast food. plus, in terms of non-food elements, the authenticity was made all the more charming by adding the lack of english speaking on the part of the waitresses and the magazine racks of Japanese edition Elle, and also the super cheesy totally Astrud Gilberto tunes making the whole place seem like you're in a Japanese supermarket. totally awesome. makes me want to go to Japan, if they don't hate Koreans. the next night Rob and i tried out the Noodle Box down the street from my place. i love noodles from any culture, so i thought this place couldn't disappoint me, but sadly it did. it wasn't bad. every dish seemed to have all the elements i wanted (noodles + nuts + tofu + mysterious kooky ingredient), but for some reason it just didn't have that kick. i'm not saying that i didn't love the convenient takeout boxes, and i'm not saying it's because the entire kitchen staff was a bunch of trendy white hipsters that asked me if i was sure that i wanted my sauce spice level to be medium, because like, medium can be pretty spicy (what part of my kimchi devouring face looks like i'm scared of spice??). it was missing that cosy touch at a good Asian restaurant has. my Indonesian noodles was drowned in coconut milk as though there had been a forestfire in my noodles and the firefighters ran out of water to flood it out. it was a tad bit spicy, not too spicy, but not the tasty kind of spicy. also...i'll say it...not a single Asian patron eating in there, except me. what does that say? and $13 for takeout noodles just can't compete with the cheap deal Chinese takeout places next door which have tastier dishes, even if they don't have the funky decorations on the wall or the hip fonts on their signs. but not every Asian place can be a Barefoot Kitchen. still, the big asian winner is still the H-Mart cafeteria. maybe it's because i'm korean, but there really isn't anything that makes a homesick gal feel like she's back at home than a crowded food court with yummy $5 chajangmyun, surrounded by old korean ladies yelling at each other in the kitchen and awful sappy korean pop music pumping out of the sound system. to celebrate five years of being together, i took rob to Tofino this weekend while he was visiting British Columbia. later i found out (on father's day) that my late grandfather and my grandmother used to go on dates to Tofino, some thirty years go, where my grandfather would catch mussels and oysters. it took us all day to get there, a bus ride, a ferry, and then i rented us a car once we got to the island. it was a little freaky for me, driving on the island. there were long stretches where i was driving along a steep, narrow cliff, with giant mountains close by one side, and a drastic drop into water on the other side....and jackass pickup trucks tailgaiting close behind me, because i drive slow. but the view was beautiful. the snow-capped mountains, lit by sunlight poking through the clouds, and the crystal clear water of the lake, in an island, in an ocean. we stopped by Cathedral Grove in McMillan Provincial Park, where there were the biggest trees i have ever seen, some over 800 years old. it was pretty amazing, and rob's eyes were so wide the entire time because he had never seen anything like that before. once we got there, we discovered that rob forgot to bring his swimming trunks. figures that we would go to the surfing capital of Canada, and...oh well, whatever. there were no celebrity sightings this weekend, but it didn't stop everything in town from being crazy expensive. tofino is one of those odd small towns that have the cozy setting of a small town (downtown is three blocks long, and full of mom-and-pop shops), but without small town prices because people like Diana Krall and Danny Devito and Susan Sarandon hang out there on vacation. so those mom-and-pop shops have Byward Market prices. but such good food, such fresh fresh seafood. we spent our day hanging out at the beach, watching the surfers confront the ocean, and hiking along the Wild Pacific Trail, which cut right through the rainforest along the coastline bluffs. there were, miraculously, no mosquitos, not even in the thick of the woods. there were crows that would steal your car keys, but no bugs at all. the whole place was this surreal world, like the island was a dream rather than a real destination. rob is visiting for the week. Because he is still on Ottawa time, he makes me go to bed at eleven PM and wake up at seven. He also makes me do stuff like order one of everything on the menu. Looks like I'll have no trouble gaining back that 20 pounds I lost this year. all week they've been advertising this Ghost Bees / Timber Timbre show but not disclosing the location other than the fact that it was going to be at a "secret loft". i've been trying to figure out where the hell it was going to be but i finally put the pieces together, thanks to the guys at zulu records, to find the address, and all i got was the address. vancouver sure likes to keep its underground music scene, well, underground. when i got there, i found myself right in the heart of the infamous Downtown Eastside, by East Hastings. as in the crime+prostitution+poverty central, the basis for the Godspeed You Black Emporer song about the end of the world, the home of the open air drug market and Canada's only heroin injection site. actually, as it turned out, i've been hanging out in the DTES a lot for a while now, only i didn't clue in that it was *the* DTES...i just thought i was on the outskirts of Gastown. Vancouver is so bizarre in the way that the city's richest and poorest all hang out in the EXACT SAME PLACES. anyway, the secret loft turned out to be a converted yoga studio, which is so vancouver, and one of the coolest shows i've been to in a long time. you had to just count the numbers on the door till you hit the address you were given, walk to the unmarked door and with blind faith, just go through and there people were. no liquor license obviously, so people were selling beer out of coolers and smoking during the sets. i proceeded to watch the most amazing sets ever, each one completely different from the previous. it was intimate like a house show, and ghost bees ended up doing a shared set with timber timbre, with them taking turns playing their songs and filling in on backup for each other. it was haunting. it was beautiful. i lay down in the middle of the "living room" and was overwhelmed at how perfect it sounded. all day i was feeling homesick for ontario, and wondering if i want to spend more years living here, but tonight might have settled that for me. if only the nighttime public transportation system wasn't so bloody awful. i've stopped writing poetry in the last few years because i always start off somewhat serious, and then give up halfway through and goof off. one day the old asian poets will rise from their graves to shake their fists at me and what i've done to their art. as I explore victoria, i've been reading Jack Kerouac's Dharma Bums which makes for a fine companion when you're travelling alone. The book reads like an odd parallel to my own adventures. As he's stowing away on steamships, I'm loading on to the ferry. As he jumps from boulder to boulder, climbing a west coast mountain, singing the praises of the beauties of the wilderness, I'm jumping from boulder to boulder as I'm tracing the shoreline of a west coast island, singing similar praises myself in my head. As he contemplates the meaning of Buddhism, I see the meditative chant OM written in grafitti in a park. I've gotten to the part where he's making up haikus with his friend while climbing the mountain. I've started writing haikus of my own, mainly because I lost my notebook and can only keep track of three lines at a time in my head. I blame Europe. I fully intended to go to a gypsy party held by the Victoria BC Ska Society. I don't actually drink alcohol these days, but I didn't want to let Germany outdrink me. France was already done after one beer, muttering about how she was much more of a red wine person. But she still beat England, who declared herself exhausted and went to bed around 9 o clock. The real winner of the night was Canada. Not me, but the other Canada, a girl from Kingston. She dragged us to the harbour, where we sat on the docks, drinking beer and swapping swear words in our native tongue, while watching the sun sink into the water. Canada left us suddenly, lugging six pack of cheap beer under her arm to take a piss behind a tree, and then we didn't see her until we finished our long walk hours later back at the hostel. The hostel room was hot as an Arizona dessert last night. I didn't bother with the PJs. Hope nobody minded. Welcome to Canada. everyone here is freaking out by the record high temperatures in the city. yesterday, it reached OVER THIRTY DEGREES. i'm totally amused. it's no use trying to explain that i come from a city that ranges from -40 degrees in the winter to plus 40 degrees in the summer. the main big deal is that air conditioning is that a regular accessory in every building here, so the buses get kind of smelly. still, it just makes it all the more awesome to wander down to the beach at 7:30 in the evening and still get a tan. thank god i live in a beach community on the west coast - nobody blinks an eye when i walk around without a shirton. i have been on a hunt for reworked vintage clothing stores in vancouver. i hit up Main Street last night, and Gastown today. many, many, many awesome designer boutiques. this is ultimately going to be very bad for my wallet. still, nothing as awesome as Preloved yet, although shop owners have been savvy enough to recognize my Preloved outfits. later i will put up some photos to show my latest purchases.